Get these three fun downloads to introduce health and nutrition concepts to your kids, whether you are a parent or a teacher (or both!). And of course, sign up for the 5 most common mistakes causing emotional eating to learn my secrets for a life full of LOVING every bite! 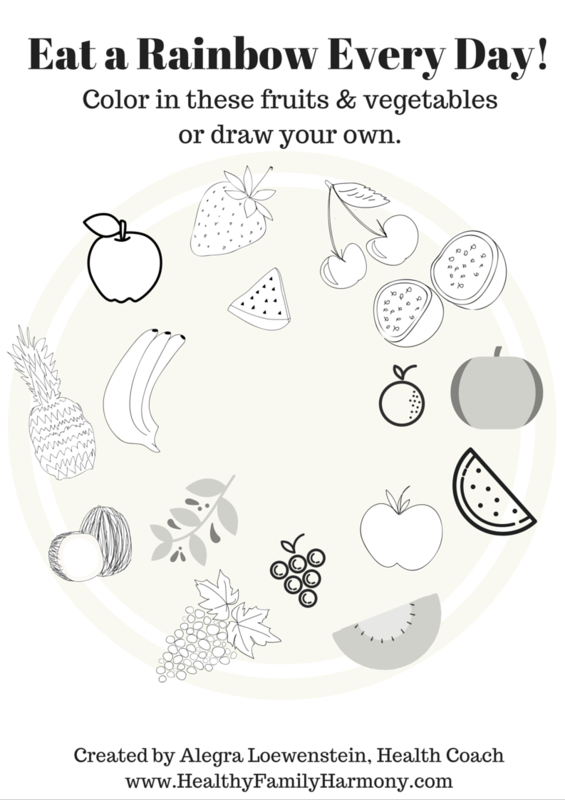 This coloring page simply introduces macronutrients to your child/student. I believe it is important to begin introducing scientific language to even the youngest children, even while explaining the concepts simply. This coloring page does just that. 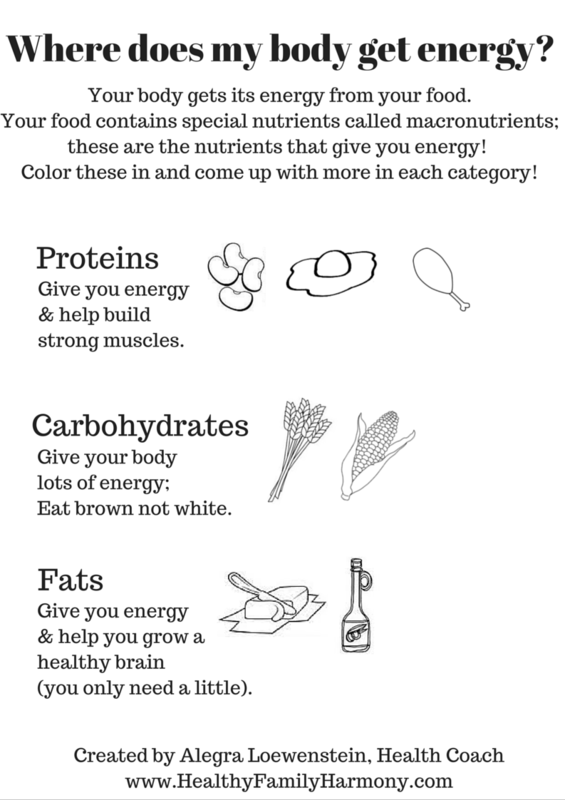 A simple page to color images from the three categories of macronutrients: carbohydrates, proteins, and fats, and explain that they all give you energy. Great for the classroom or homeschool! This is a fun topic for kids because they want to how they get their energy to run and jump! It is also a GREAT introduction to nutrition basics, as it shares the three macronutrients (fat, protein, carbohydrate) where all calories come from, and also where you get some of the essential building blocks of good health. This can help empower families to make health choices throughout the day as you they can make sure you are not eating from only one category. 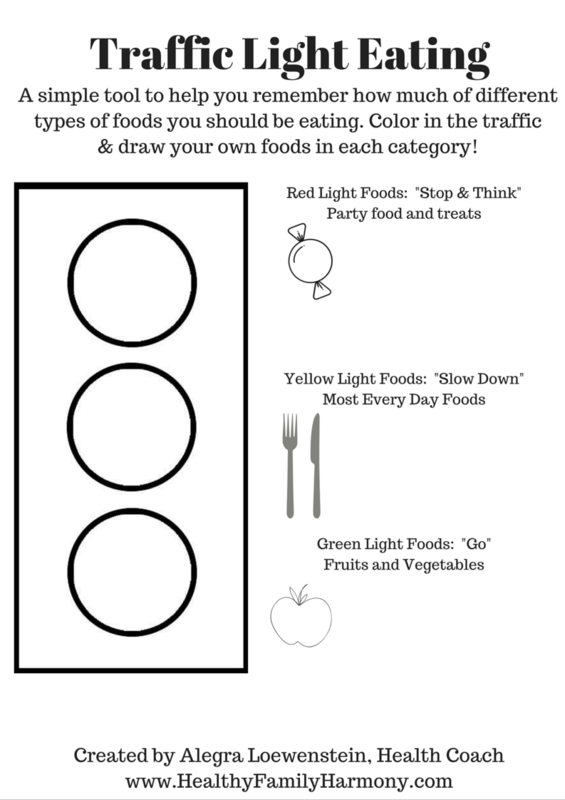 This is coloring page for kids that introduce the concept of traffic light eating, a simple way to help kids understand that some foods you should "stop and think" while others are always "good to go." A great tool to talk about the basics of healthy eating, and a wonderful tool for the classroom or home school! This is a basic concept I teach my clients. It is great to use for yourself or your kids. It is how to eat simply- without dieting or number crunching or worrying. It is also simple enough to introduce to your kids to help them become empowered to make their own healthy choices! Green = Go, which is fruits and vegetables (and for some families nuts and salmon), which you can eat as much as you want! Traffic Light Eating is a basic concept I use in my Pantry Makeover and also one that many Coaching Clients find effective for themselves as well as their children. Discover how to love every bite!